With our domestic laundry duties completed the night before, cases packed, we’re off to take our first shinkansen or bullet train to Okayama. We walk across to the station find the appropriate gate and are told we can actually get an earlier direct train rather than the 10:13 we’d planned that meant a change at Shin-Osaka. 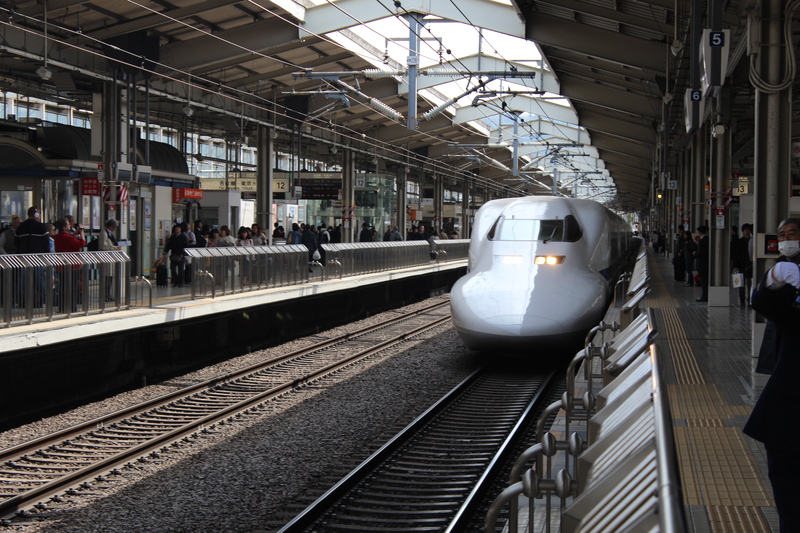 Some shinkansen are not valid for travel with JR passes so we were delighted to be told to get up there and get on. A swift purchase of a sushi box for breakfast and we’re on the platform. Slight surprise that the platform is not at ground level but up a level on stilts. Important to check with the sign boards which coaches (carriages) are for unreserved seats on a highly accurate poll of two trains it seems they are usually the front three or five so it’s good to be waiting in the right place when the train arrives. The coach numbers are clearly marked on the platform and orderly queues form behind them. A sleek, shiny beast slides into the platform but it’s not ours. It disgorges its passengers and loads new ones swiftly from orderly queues – the Japanese do queue in the most disciplined manner everywhere – while a guard signals repeatedly to each end of the train before waving it out. Ours is next and on we get. First impression of how much space there is. We were worried about stowing our copious baggage but it fitted in easily. There are loos and recycling points every two carriages, a trolley service comes through with acceptable coffee and sandwiches and so on which we didn’t need to try having scoffed our sushi. After that initial delight the actual journey was a bit dull. Much of the track runs through noise-reducing barriers or tunnels so you can’t see much. 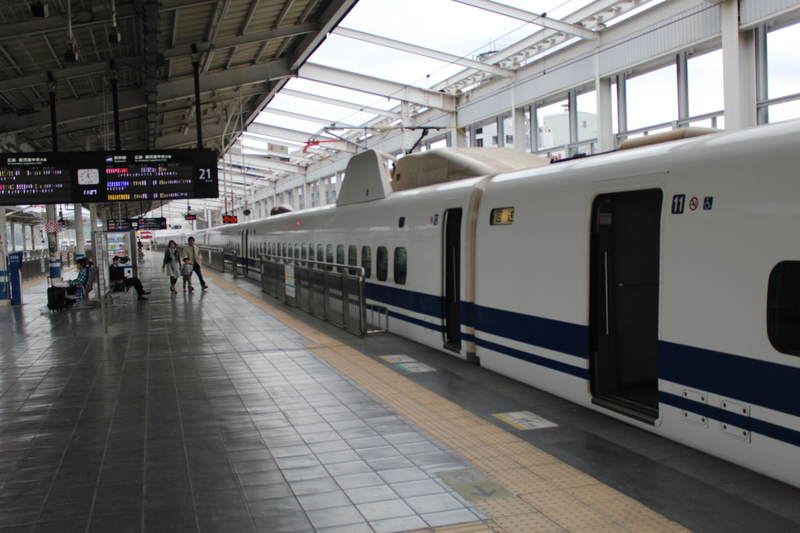 But it is quite fast once it gets out of the station area. You feel that satisfying little push of the seat into your back as the acceleration kicks in. From Kyoto to Osaka is only 26 miles and we did it in 13 minutes so quick but not amazing. 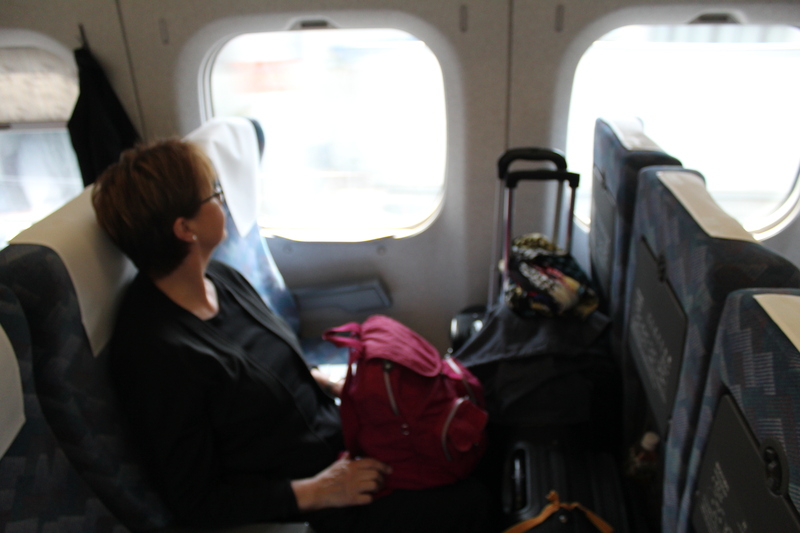 The rest of the trip to Okayama was similar because of three more stops but we have longer journeys ahead. Arrival at the hotel in Okayama way ahead of check in time which as usual was three o’clock, we were utterly charmed by the hotel director who came to greet us, told us a room was ready which we could occupy straightaway with no extra charge. Mr Yamamoto speaks fluent and elegant English and had spent years travelling with groups of traders in Europe and Asia and has the style and urbanity of a well-travelled gentleman. I enlisted his help shortly after we had gone to our rooms to see if he could suggest somewhere special for dinner on Dee’s birthday next day. He went off to make enquiries and later came up with a solution and then booked both the table and a taxi to take us there. 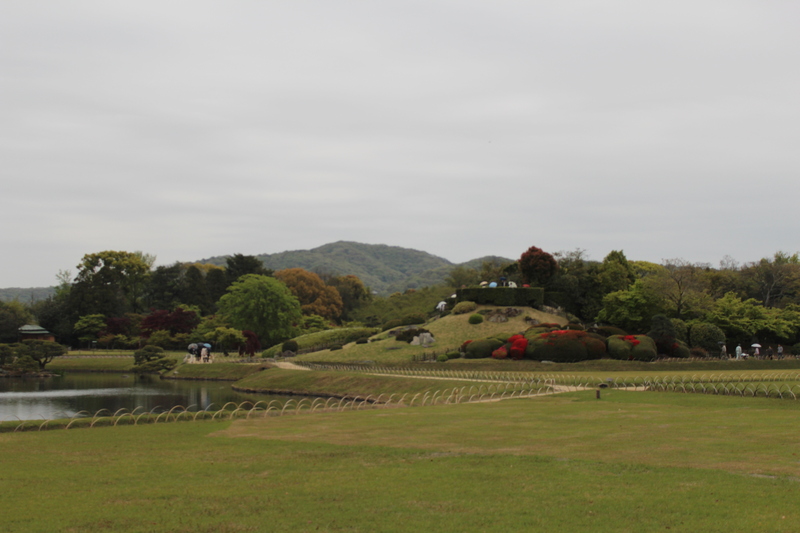 We then walked off to see number two in our great gardens of Japan subquest. 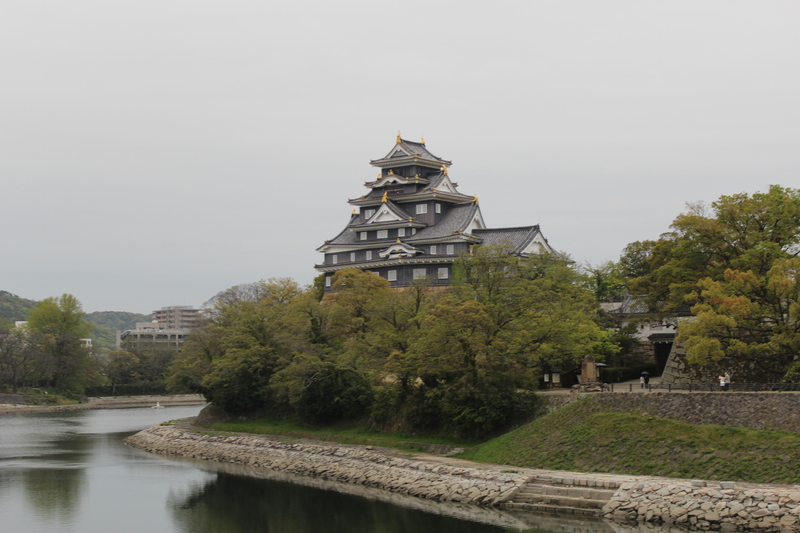 Okayama is delightful. 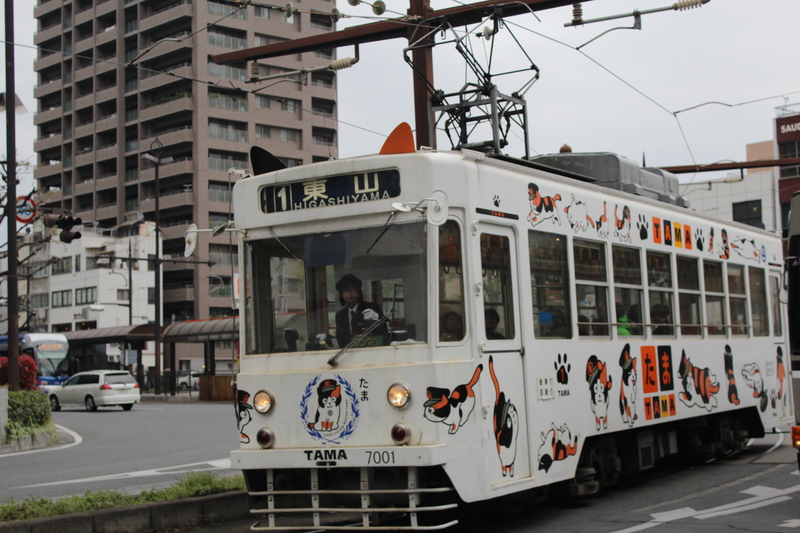 It has really funky trams, loads of buses, broad main streets behind which lie lots of atmospheric smaller ones. It feels lively and very cultured. 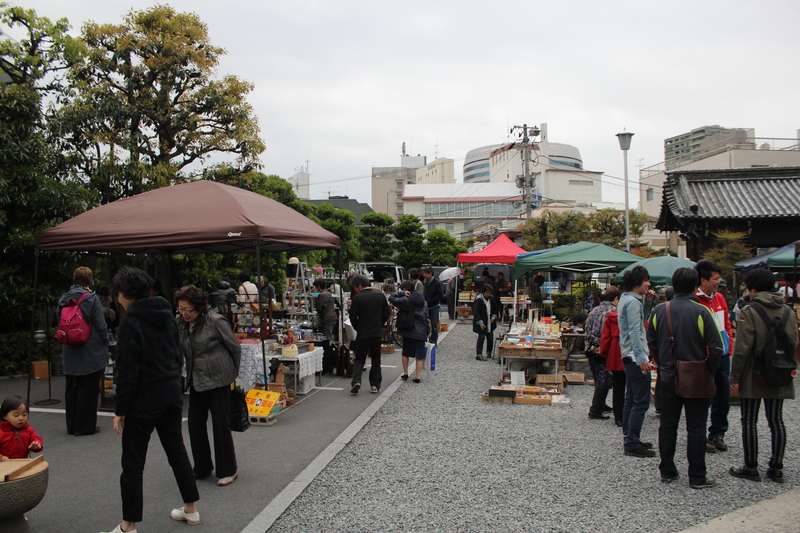 On the way we passed by, and were of course, diverted into a Saturday flea market in front of a shrine. Lovely pots too big to think about, dubious netsuke, old farm and cooking implements, clothes, books, prints and stall holders rushing to erect gazebos as the rain started. We did however stand on the bridge and watch cormorants in the river before going on into the Koruaken and were well rewarded. The spaciousness, variety, beauty of the planting and the “borrowed landscape” of a nearby mountain worked superbly. The rain mostly held off too. 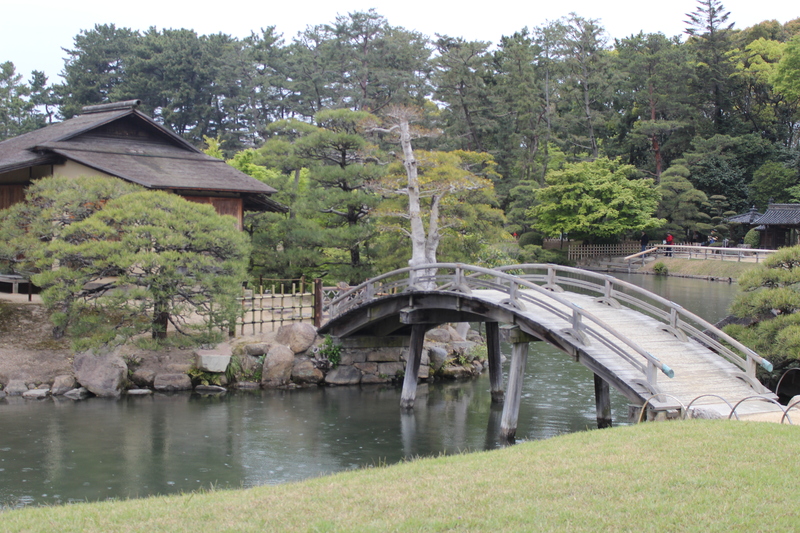 It’ll also, like Kenrokuen in Kanazawa, have it’s own page when we are back in the UK and can sort the photographs. On then to Okayama Castle which is impressive and we hoped would have an exhibition of wood block prints, judging from the poster we spied. It did, but only three of them, poorly displayed and part of a bigger exhibit on travel in the Edo period which was interesting but not what we’d hoped for. 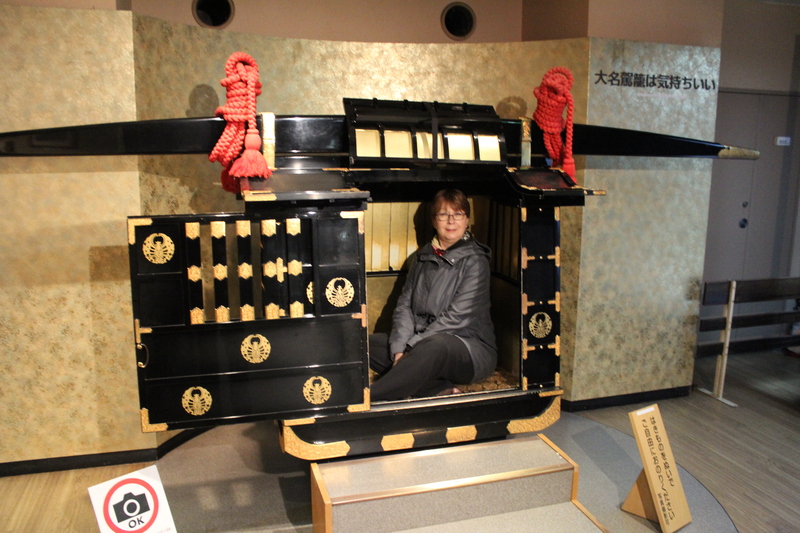 However the nearly birthday girl did get to be carried in a palanquin! 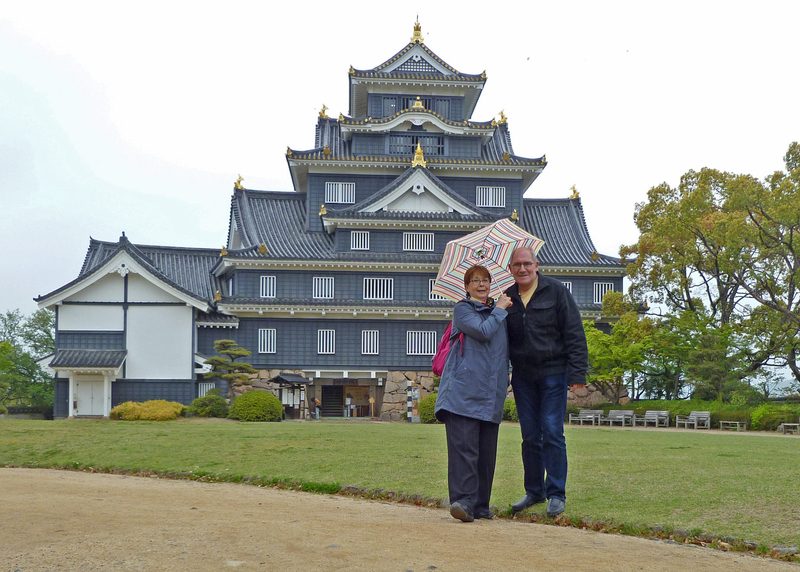 From the castle we went, getting soaked now, in quest of Maruzen Books where we succeeded in purchasing our coveted road atlas of Japan. 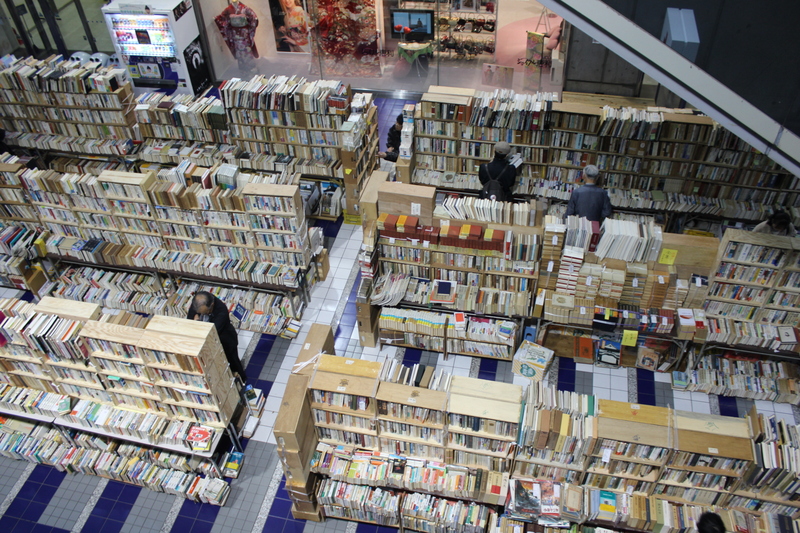 Incredibly in a modern shopping mall were stacks and stacks of second hands books being eagerly leafed through but good numbers of people. It was a bit like a vertical version of the stalls under Waterloo Bridge outside the National Theatre. We then wandered through a long shopping arcade with a Dutch Week so tulips and pancakes everywhere. We got lost and finally made it back to the hotel extremely bedraggled and determined to eat very close to the hotel. It couldn’t really have been closer – diagonally across one street, in fact a pleasant, well-planted and landscaped canal-side walking area rather like the Gion Canal in Kyoto – and into Hachimonji a small but crowded Japanese restaurant where we were taken in hand by a gentleman of some years and guided through a “we’ll give you the best things to eat” menu. Sashimi to start was fine. Then small fish, increasing less strange vegetables, broad beans, rice of course and tempura and finally fresh strawberries, with local biscuits and a soft jelly-like blob of subtle and excellent taste. All washed down with a few beers and some sake. As he relaxed with increased shochi consumption, it was clear that he’d fallen hook, line and sinker for the charms of my wife. I was forbidden to speak any Japanese because my wife speaks it so beautifully. She’s taught the Japanese for beautiful so she could accept his compliments. The husband and wife chef and patronne spoke a little English and went along with the banter and joshing until he took a phone call from his wife asking where the hell he was – we heard Igirisu in his shamefaced reply so we knew we were being used as an excuse. The time to break up the party finally came but not before everybody in the room had joined in a rousing rendition of Happy Birthday to Dee. Does everybody meet characters like this on their travels or is it something about us? I am envious of you amazing trip. 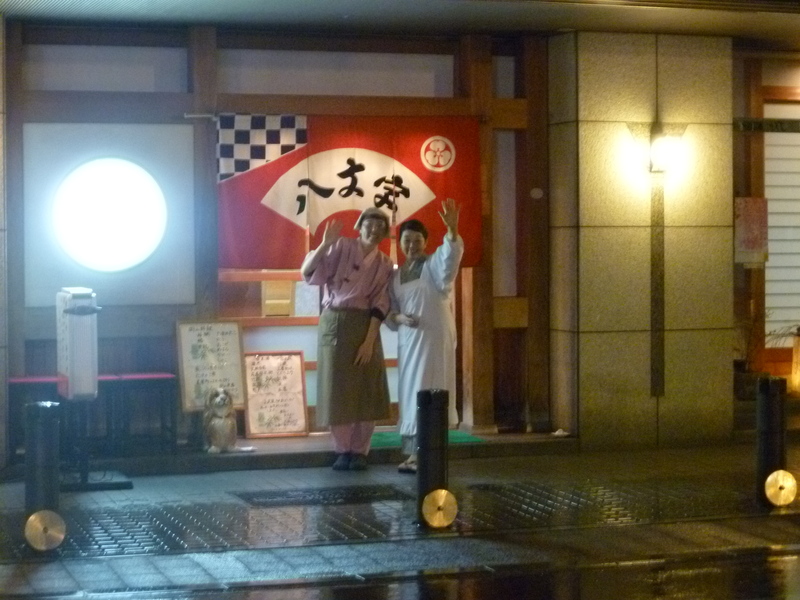 brings back happy memories of some of our experiences in Japan. Can’t wait for the next chapter!! Have you ever read “Haikus for Jews”? I did catch the link Gwyn. Thanks very much – books pictures taken with you in mind. I haven’t read “Haikus for Jews” but will catch it on our return.